As a Texas homeowner, you probably have a long list of renovations you’d like to perform on your home. From upgrading your kitchen appliances to renovating the master bedroom, there’s a good chance bathroom lighting is low on your list of priorities. At M&M Lighting, we’re proud to offer affordable and stylish bathroom light fixtures to improve the interior decor of your home. When it comes to the lighting in your bathrooms, it’s important to choose fixtures that provide the correct amount of lighting while also complementing your bathrooms modern decor. 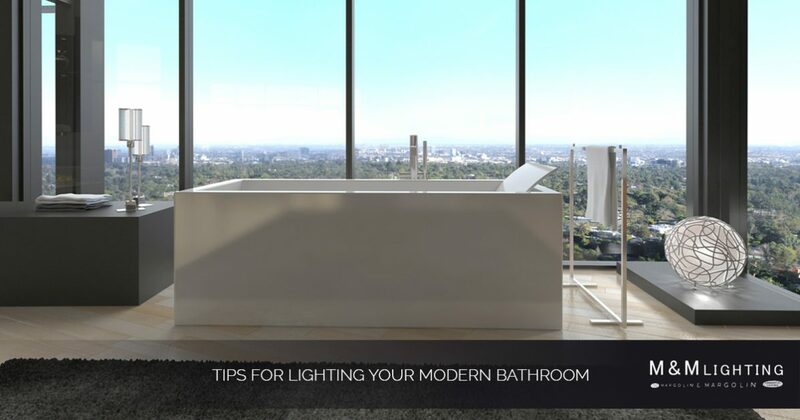 In this article, our lighting experts have compiled a list of tips for lighting your bathroom. If you need help choosing the best light fixtures for your home, contact M&M Lighting in Texas today! When it comes to your interior lighting, your bathrooms are probably given the least consideration among all of the other rooms in your home. Placing ample light near showers, bathtubs, vanity mirrors, and sinks is essential to enhancing the overall comfort and mood of the room. If you’re looking for ways to improve the lighting and comfort of your bathrooms, consider the lighting tips below. If your bathroom lacks proper lighting near the vanity, you may have a hard time seeing when you brush your teeth or get ready in the morning. One of the most common mistakes people make is installing recessed ceiling fixtures directly above their bathroom mirror. This can cast an unwanted shadow on your face, making your daily grooming routine much more difficult. A lighting option worth considering that won’t cast a shadow on your face are installing vertical fixtures or sconces on either side of the mirror. However, depending on the size and positioning of your vanity mirror, sidelights may be an impractical lighting solution. The second area to examine in your bathroom is the shower. 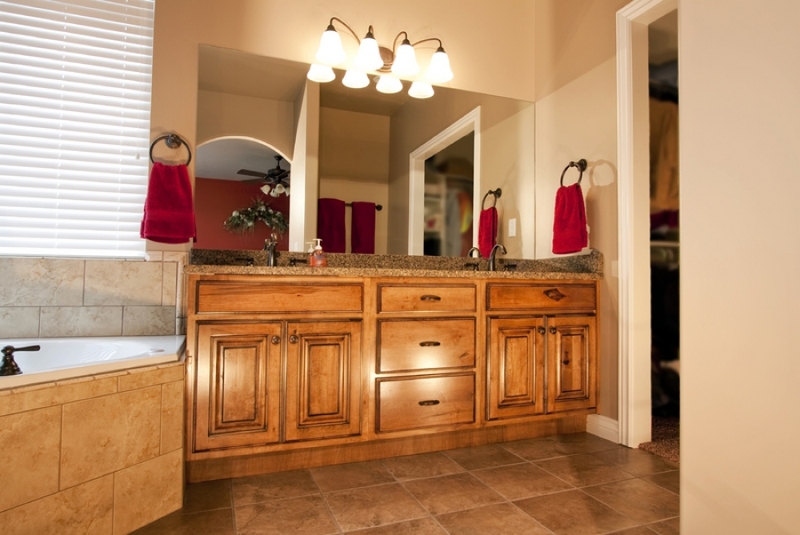 If you have a smaller bathroom, a dedicated dedicated light fixture may not be necessary. A great option to consider is recessed lighting, which can also work well over a freestanding tub or toilet. Ambient lighting, or “fill-in” lighting, is meant to be used as a substitute for natural light. If your current bathroom is dimly light, ambient lighting can go a long way in improving the overall atmosphere of your bathroom. This type of lighting can often be supplied by a central fixture or a surface-mounted ceiling light. If you have pieces of art displayed on your bathroom walls, a small recessed spotlight can help enhance your hanging pictures while adding another layer of light to your bathroom. Similarly, a recessed shower light fixture can be tilted and angled to highlight fancy tilework along your bathroom walls. When it comes to choosing light bulbs for your bathroom lighting fixtures, you may be wondering what type of bulb is best. A crisp white light tends to render skin tones more accurately, and halogen bulbs set the glowing gold standard. There are several types of low-voltage bulbs that can also give your bathroom a beautiful, sparkling effect. While halogen light bulbs can cost a few dollars more than standard incandescents, they can last up to three times as long. The newer fluorescent bulbs also offer good color rendering and typically offer ten times more efficiency than regular bulbs. If you’re looking for a way to set the mood in your bathroom without spending an arm and a leg, consider investing in light dimmers. In a very small bathroom or powder room, adding dimming features above the vanity can provide ambient lighting and accent lighting. Not to mention dimmers can help you save money on your energy bills. By dimming just one light bulb in your bathroom by ten percent, it will last twice as long as a standard bulb at full brightness. If you need assistance choosing the best light fixtures for your bathrooms, contact the lighting professionals at MM Lighting today. We offer a variety of bathroom light fixtures from the best lighting manufacturers in the world including Sea Gull, Kichler, Hinkley, and Kalco.